As soon as the Ferguson, Missouri, grand jury released their verdict on Monday, November 24th, against indicting Officer Darren Wilson for fatally shooting Michael Brown this summer, protesters took to the streets across the country. An outpouring of dissent against the decision, and a second protest drew more demonstrators to Union Square the day after the verdict. After its beginning in Union Square, the protest soon entered the streets, flowing onto roads and encouraging passerby on the streets to join them. Motorists had isolated confrontations with demonstrators, including an incident where a demonstrator climbed onto the rear fender of a parking car in front of a hotel. 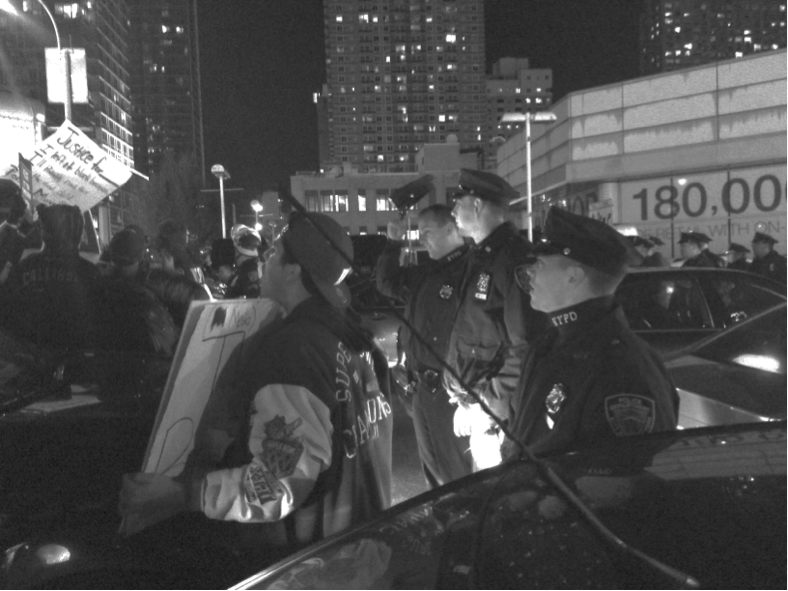 The protesters made their way through the streets to the Lincoln Tunnel’s entrance, where NYPD forces lined up to establish a blockade. Traffic was held up as demonstrators and police stood face to face at the tunnel, and the march caused periodic disturbances along its route, but non-demonstrators were not upset. “I stand by everyone protesting,” said an anonymous Brooklyn woman standing on the sidewalk as demonstrators marched in the streets. One arrest was made at the Lincoln Tunnel when, according to bystanders, one individual tried to run through the police line. Police officers and Deputy Commissioners of Public Information walking along the march declined to comment at the tunnel or at any other point of the demonstration. Many of the assembled protesters expressed one singular reason for their presence. “I am going to this protest because I strongly disagree with the jury as to the decision that was made about Darren Wilson that he was not indicted, even though he should have been charged with at least manslaughter,” said Kira Carleton, a BHSEC sophomore. “I’m here because I’m angry, and I’ve been angry for a while,” said a Washington, D.C. resident who asked that her name not be disclosed. Dozens of officers flanked the march, on foot and mounted on motorcycles. Two helicopters circled around the demonstration at its onset in Union Square, and that number increased to four soon after protesters took to the streets. It could not be discerned, however, if the helicopters were operated by the media or by the NYPD. Many protesters also expressed irritation at the authorities of attempting to steer the march away from major venues to dim its effect. At one point, demonstrators broke into a run to gain ground and, ostensibly, to prevent police control over their direction. Numerous BHSEC students were seen at the fore of this charge. Y2 Mojique Tyler acted as one of the main organizers within BHSEC to bring students to this protest. In the days prior to the verdict, he actively used social media to bring attention to the topic. He said “I’m really happy with the number of people who came out, but I wish there were more here. More people need to care about this.” Mojique estimated that 20-25 BHSEC students were in attendance, higher than his expected amount of 15. BHSEC students Jesus Valdez and Eugene Varnedoe also made their presence felt, carrying aloft a sign bearing the slogans “No justice, no peace” on one side and “Stand & fight” on the other. Protests were slated to continue through Friday, November 28th to continue the reaction to the verdict, with the objective of rebranding the shopping holiday into a “Black Lives Matter” Friday.